In January 2013 President Obama signed an Act to amend title 38, United States Code which included Section 201 the Establishment of Open Burn Pit Registry. The VA's Action Plan: Burn Pits and Airborne Hazards includes a Registry for Veterans who may have been exposed to the burn pits or other airborne hazards. The VA's Airborne Hazards and Open Burn Pit Registry will allow OEF/OIF/OND and 1990–1991 Gulf War Veterans exposed to burn pit smoke and other airborne hazards to document their exposures and report health concerns. Veterans will enter information through a web-based questionnaire and have the opportunity to obtain an evaluation. The registry will keep Veterans informed about studies and treatments. It will also help VA to monitor the health conditions affecting Veterans. The VA will use the data to improve their programs to help Veterans with deployment exposure concerns. Many veterans, initially, were denied "service connection" to their illnesses by the V.A. based on two outdated CFR's. These CFR's need to be updated to reflect current medical research and policy. Cases denied based on these CFR's should be re-opened. 38CFR3.309 Disease subject to presumptive service connection deals mostly with the following categories: chronic disease, tropic disease, diseases specific to radiation (during WWII) and diseases with certain herbicide agents (during Viet Nam). There are no parameters that fit the situation of the burn pits or other chemical exposures our veterans today may face. 38CFR3.307 also deals primarily with the above issues. It too, fails to address issues facing veterans dealing with modern chemical exposure. When service connection is denied veterans and their families do not receive the help, benefits and support they so desperately need and deserve. Disabled American Veterans (DAV) has been actively involved in this issue from the beginning both by actively lobbying for legislation and testifying before Senate as well as helping affected veterans deal with their VA claims. The DAV will help veterans with their cllaims and to fight unjust denials free of charge. In 88 offices throughout the United States and in Puerto Rico, the DAV employs a corps of approximately 260 National Service Officers (NSOs) who represent veterans and their families with claims for benefits from the Department of Veterans Affairs and the Department of Defense. 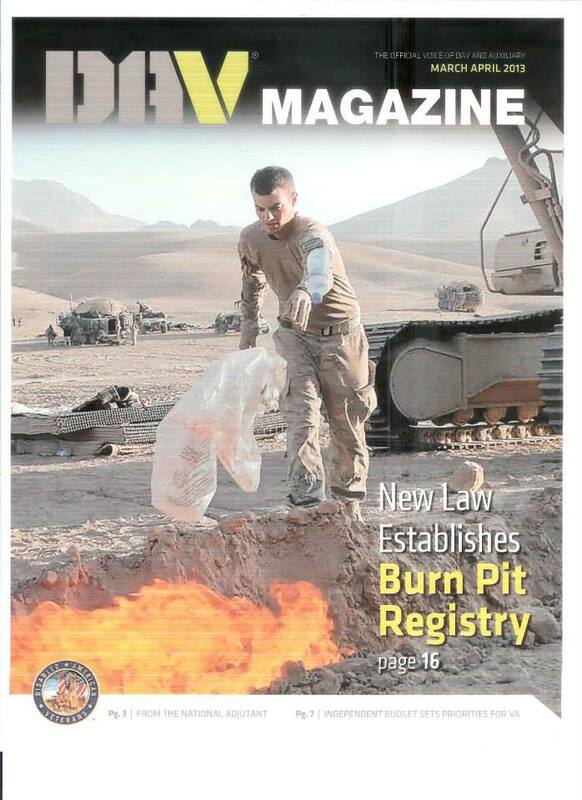 Please check out the DAV's excellent article in their March/April 2013 issue New Law Establishes Burn Pit Registry. H.R. 2510- Helping Veterans Exposed to Toxic Chemicals Act - Directs the Secretary of Defense to establish within the Department of Defense (DOD) three centers of excellence in the prevention, diagnosis, mitigation, treatment, and rehabilitation of health conditions relating to exposure to open burn pits and other environmental exposures. Your support will make a difference! Register your opinion via PopVox. The National Defense Authorization Act - H.R. 2647 has been signed into law. It included important provisions to protect the thousands of troops exposed to open, toxic burn pits used in Iraq and Afghanistan, which have sickened hundreds of troops. These provisions were based on the Military Personnel War Zone Toxic Exposure Prevention Act, (HR 2419) introduced May 14, 2009 by Bishop and Shea-Porter. Please take a moment to become a fan on Facebook! We try to keep fairly active with social media.